I should stop complaining about my kitchen being too cramped. In The Little Paris Kitchen , Rachel Khoo explains how she turns out all kinds of French classic dishes from her apartment kitchen with a mini oven and a stove top with only two burners. I recently received a review copy of the book, and it’s full of all the sorts of things you’d expect to find in a cookbook of classic French dishes. But here, the recipes have been given some updates and a little streamlining in places making them simple enough to tackle in a tiny Paris kitchen or anywhere else. There’s Soupe au Pistou, Gratin Dauphinois, and Quiche Lorraine of course. And, there’s also Croque Madame Muffins which are cute, individual servings and Salade Nicoise reinterpreted as lettuce wraps. The Bouillabaisse, Poisson Meuniere, and Poulet au Citron et Lavande are a few dishes that look perfect for company, and the desserts are all dinner-party worthy too. The Chocolate Mousse is made with cocoa nibs and the classic Creme Brulee recipe includes several suggestions for mixing up the flavors with using things like saffron or cinnamon and ginger. Then, I noticed the Champagne Sabayone with Strawberries and Cherry Tomatoes. I mentioned some of the classic recipes have a twist, right? Rachel points out that, scientifically speaking, strawberries and tomatoes have the same flavor components and therefore should go together. I decided to give it a try. The sabayon was made in the typical way in a heat-proof bowl over simmering water. Four egg yolks and two tablespoons of sugar were whisked while being gently heated in the double-boiler. When the yolks became pale and thick, six and half tablespoons of Champagne was added. In this kind of situation, I go for convenience. Since I was making the sabayon in advance and planned to chill it for a bit before serving, I didn’t really want to open a whole bottle of Champagne. Instead, I popped open a convenient, little can of California sparkling wine for the six and a half tablespoons I needed for this. After adding the sparkling wine, the mixture was whisked for another ten minutes while continuing to gently cook. When thickened, the sabayon was divided among serving bowls and topped with strawberries and quartered and seeded cherry tomatoes. I added a pinch of freshly-ground black pepper because I like it with both strawberries and cherry tomatoes. I wasn’t entirely sure the cherry tomatoes wouldn’t seem odd with the sweet sabayon and strawberries, but happily, I was wrong. With the seeds removed from the cherry tomatoes, the flavor of the two fruits is surprisingly similar when eaten together. You can make this a couple of hours in advance and chill it, or it’s so quick to make, you can whisk it together just before serving. It’s a modernized, classic dessert that easy to create in any size of kitchen. A divine sabayon! A perfect summer treat. 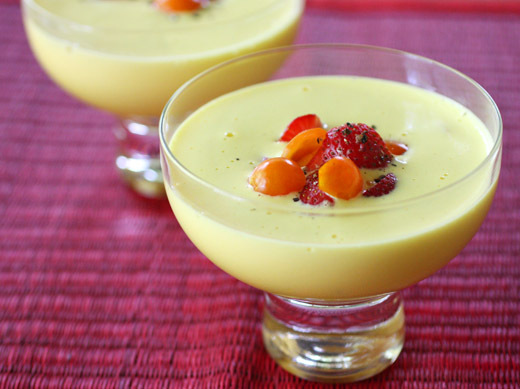 A delicious fruity sabayon, Lisa. I never would have thought to pair strawberries and tomatoes! What a tempting recipe! I have have been thinking about purchasing this cookbook and am glad to read your review! She does amazing thingsin her small kitchen but I would never have thought of adding cherry tomatoes to this dish but they are, of course, a fruit technically so I guess it should work. how interesting! i'm not sure i've ever had strawberries with tomatoes in any form, but i'd be game to try it! the black pepper is great to tie it all together. I've never thought to put strawberries and tomatoes together - what a clever idea! This is really lovely Lisa! Genial combinación ambas frutas muy refrescantes una copa deliciosa,hugs. I've never tried tomatoes and strawberries together, but this certainly looks good. I'm crazy about sabayon anyway. I might have omitted the pepper finish. but trust you implicitly. 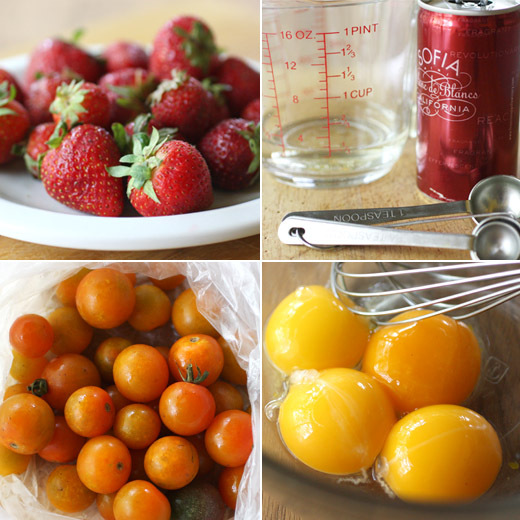 I agree with everyone...I never would have thought of pairing tomatoes and strawberries, especially in a dessert. Looks beautiful. I've had strawberries and tomatoes together in a salad (and you're right, they really work well together) but never in a dessert. Great idea! Definitely something I'll play with - thanks! I suppose they both are fruits but I'm not sure whether I would be brave enough to put them together. I'm a bit of a traditionalist at heart. 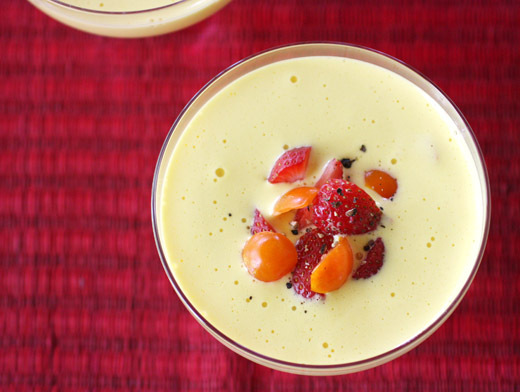 I would quite happily get stuck into your Champagne sabayon and strawberries :-) Looks delicious! Lisa, so fascinating about the cherry tomato-strawberry combo. Who have thought? I used to have a mini oven (but with four burners), it made cooking challenging, but also very fun! I love this beautiful way of highlighting spring/summer berries. CA sparkling wine to the rescue! Adding tomatoes is definitely an interesting way to get folks to eat their vegetable-like fruits! Sounds interesting and looks absolutely delicious,Lisa! Looks so refreshing and delicious Lisa! No matter how big my kitchen, it is always too small. I should learn to make a sabayon since I think a dessert like this is just so elegant and perfect at the end of a French meal. Yours are gorgeous. Sabayon is such a special treat and so impressive! The addition of cherry tomatoes sounds really interesting.